The BJP government sailed through its first no-confidence motion, with 325 members opposing it and 126 Opposition members backing the motion. In a bid to woo the farmers after the government’s victory in the no-confidence motion held in the Parliament on Friday, Prime Minister Narendra Modi on Saturday addressed a ‘Kisan Kalyan Rally’ in Shahjahanpur district of Uttar Pradesh. 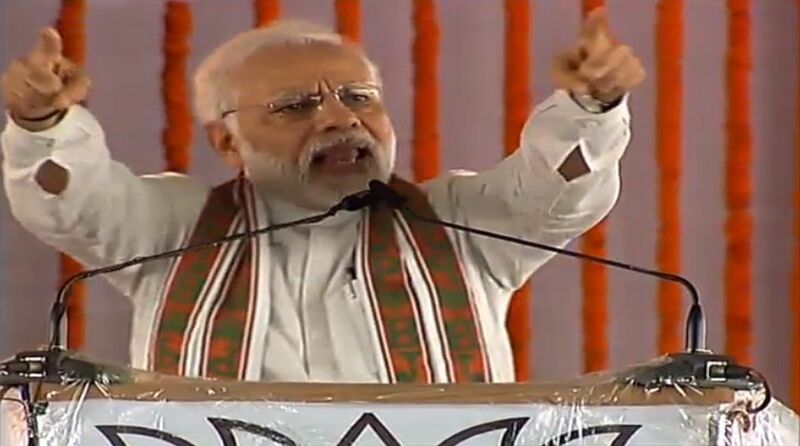 The rally in Roza area is Modi’s fifth public address in Uttar Pradesh in three weeks, indicating the importance of the state – which has 80 Lok Sabha seats – in BJP’s calculations ahead of the 2019 general elections. In a scathing attack on the opposition Congress and other parties, PM Modi said the no-confidence motion was moved against the government as it had begun to curb the illegal activities and corruption prevalent in the country. Asserting the farmer population as the priority of the Central and Uttar Pradesh government, Modi said the party would ensure that the hard work of the farmers of the nation is respected. PM Modi also took a dig at the “unwanted hug” he received from Congress chief Rahul Gandhi in Parliament, and said the coming together of many parties against the BJP will only help the ‘lotus’ bloom. “We asked the reasons for their no confidence but when they failed to give it they ended up giving an unwanted hug,” Modi said, referring to Gandhi’s embrace. “There is not just one ‘dal’ (political party) but dal over dal resulting in “dal-dal” (marshy land) which will only help the ‘lotus’ bloom,” he said while addressing the farmers rally. After wrapping up his speech on Friday, Congress president Rahul Gandhi took the House by surprise after he walked over to where PM Modi was seated and hugged him. Earlier on Saturday, PM Modi had tweeted that he always enjoyed being with the farmers and that it was due to their hardwork that India had achieved so much. Rahul Gandhi, had on Friday tore into the ruling government for ignoring the plight of farmers and youth. He had also accused the prime minister of shielding the corrupt and colluding with rich businessmen. He also attacked the government on issues of Rafale jet deal and Doklam standoff. The Narendra Modi government sailed through its first no-confidence motion in the Lok Sabha, with 325 members opposing it and 126 Opposition members backing the motion. A total of 451 MPs were present in the House after BJD members walked out and Shiv Sena decided to stay away from voting. TRS members were also not present in the House when the voting took place, while several AIADMK members opposed the motion in a boost to the NDA. On the first day of the Monsoon Session, Lok Sabha Speaker Sumitra Mahajan had admitted the motion moved by the Opposition including the Congress and former BJP ally TDP. TDP chief N Chandrababu Naidu had sought the support of other parties for the motion, citing the NDA government’s “non-fulfilment of the promise” in granting special status to his state.